The algae actually are no algae but cyanobacteria. They belong to the oldest organisms on earth. It is true they resemble like algae and can recognized by their usually dark blue green colour. They form a kind of ‘skins’ or ‘oval little balls’ their size being about that of a little marble and they have a bad smell. They feed themselves with ammonium. Their presence in a pond consequently indicates a surplus of ammonium (a harmful substance), which means that biologically the filter does not work. 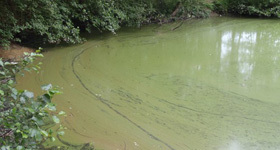 You are advised not to swim in ponds, which contain too many blue-green algae. What may cause the presence of the algae is the number of fish and excessive feeding of fish. The phosphate content will increase too much; 0.5 mg per litre is the maximum. Also too low nitrate content can be the reason, a value ranging between 5 and 10 mg per litre is ideal. What can you do to remove the algae? Remove the dirt from the bottom and clean the filter. Remove as much blue-green algae as possible. Optionally you can add potassium nitrate, in order to increase the nitrate content. Do not feed your fish too much. You should see to it that your fish eat the feed distributed within a few minutes.